(Newser) – The Hubble space telescope got some improved vision today in the form of a new camera. Two Atlantis astronauts completed a seven-hour spacewalk to give the 19-year-old telescope a much-needed upgrade, Space.com reports. "Woo-hoo, it's moving out," said astronaut Andrew Feustel after the old camera refused to budge at first. 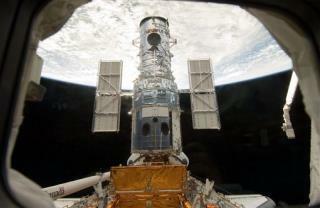 The spacewalk is the first of five planned over the shuttle's 11-day mission to service Hubble. So far so good -- my prayers are with these folks.